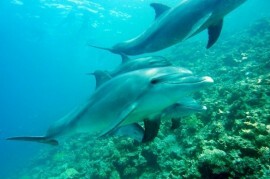 Dolphins and other cetaceans during her whistle. According to an experienced biologist Sam Ridgway thereby proclaim their joy. Similar to when enthusiasm squealing children. Sam Ridgway has to study the behavior of dolphins and whales rich experience. While exercise is often rewarded tasty fish, and these marine mammals have responded by whistling. Ridgway's first thought signals to other members of his group about the food at hand. One day, his wife Jeanette noted that these sounds remind her whoop enthusiastic children. They could not even give these mammals whistling show their pleasure? Ridgway had this idea interesting, verify it and see the results published in the Journal of Experimental Biology. People instructor dolphins is for mastering a new task often reward the whistle on whistle or buzzer and a delicious delicacy in the form of fish. After the animals can do exercise, inform the animal only whistle that food gets later. Dolphins and belugas respond to that also whistling. Ridgway noted, however, that these marine mammals whistle even when no food in the foreseeable future can not. Piped and after the time of the next task of successfully off the buzzer at depths of several hundred meters. They squeak in this case it could somehow be related to the food, even the sound of the whistle as a reward for successfully performing the tasks. Ridgway compared their findings with studies of the 50s dealing with the release of dopamine - a chemical that is responsible for the animals at the feeling of joy - after electrical stimulation of parts of the brain responsible. A few months after painstaking analysis of sound recordings is convinced that belugas and dolphins whistling really express their joy. In January-country, in the September after their! Waiting in vain for the delivery of a package? 'Do Ruky' not in your hand? Defend yourself. Milovická Mirakulum: records with multiples, drumming and "Koala"! This is the end, she thought Ukrainian Raisa, when the grenade struck the house ..
Any use of content including receipt, distribution or other accessing articles and photos without permission is prohibited.